Polystyrene pods are being trialled by Help Bristol's Homeless so rough sleepers can stay warm overnight. The polar pods, created by a window fitter, take two hours to build and cost £200 each. Rough sleeper Az Giovanni-Ullah, who used on the pods, said: "I had a comfortable night's sleep, no trouble, could hardly hear any noise." Bristol City Council said it wanted to get more people off the streets - not make rough sleeping more comfortable. Inventor Mark Price said: "There's always news about homeless people being freezing cold, but if you get a good night's sleep you can survive. "If there's a problem then you have to come up with a way to solve it. If I can do something, it's better than doing nothing." Mr Price is now encouraging others to back the non-profit initiative so more pods can be rolled out across the city. The council deals with about 1,000 rough sleepers a year and says 90% of them get housed. No more than 100 people rough sleep in Bristol. Cabinet member for housing Paul Smith said: "They are not the answer, the reason we have got a large number of people sleeping on the streets is because of reductions in support services, changes in the benefit system and lack of social housing. "We want to get people indoors not make it better for people to be on the streets." Since 2013, 50 people are known to have died while sleeping rough in Bristol. Mr Giovanni-Allah added: "It definitely kept the warmth in so much better than sleeping out on the streets. "It's a heck of a lot comfier than sleeping on the concrete floor." 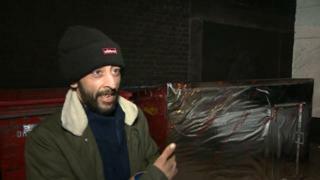 The BBC has contacted Help Homeless Bristol to see how well the project is progressing.